Every type of home needs a little TLC now and then, but there are a few log-specific items you should address to keep your home pristine. It doesn’t seem possible, but autumn isn’t that far off. While the weather is still pleasant, now is as good a time as any to get outside, give your log home the once-over and address any maintenance items that pop up. Here are our top four fall tasks. 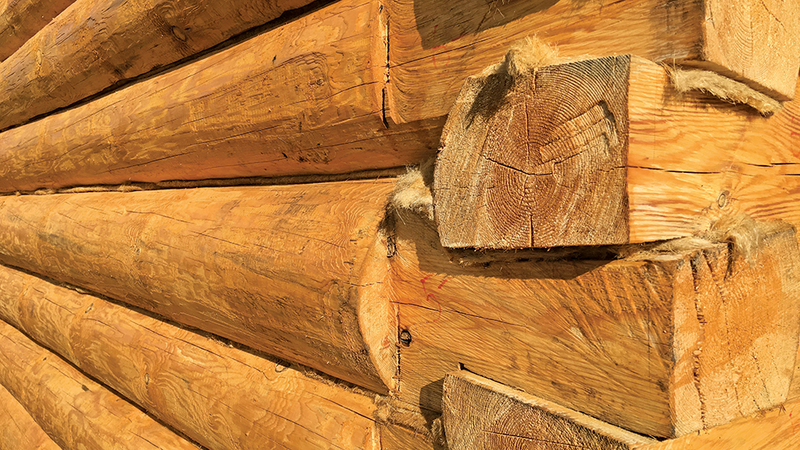 The harsh summer sun can break down your log home’s exterior stain, especially on southern-facing walls. Fading isn’t just an aesthetic issue, it could mean that the protective coating isn’t doing its job to its fullest. This could result in water penetration, which can lead to rot or mold. To test, spray water from a garden hose onto the surface. If it beads and runs off, your coatings are sound. If the wood darkens in places, it could be time for a reapplication. If that’s the case, be sure to use products from the same stain manufacturer, or ones that are compatible. Wood fibers crack and separate naturally and do not cause structural problems in log homes. However, if you have upward facing checks on your exterior, they could collect and retain moisture, allowing it to get deeper into the wood and potentially cause rot. If you see evidence of upward-facing checks, deal with them immediately by filling the gaps with a log-specific filler that’s clear or can be stained to match the wood tone. Summer is the high-season for insects, like carpenter bees, to move into your home uninvited. They don’t eat wood, like termites, but they do tunnel into wood to lay their eggs, and August is about the time when the larvae start to emerge. As the saying goes, an ounce of prevention is worth a pound of cure. Oil and polyurethane coatings can help keep them away, but you’ll also want to spray an insecticide with pyrethroid as the active ingredient. If you find they’ve already moved in, Borax has been a standard method of extermination but can be toxic to other wildlife. EPA-registered products, like BEE-Gone by ISK Biocides, have been developed specifically for log home applications and are effective at controlling wood-destroying insects. It’s vital to have a healthy roof and clean gutters, no matter what kind of house you have. But in a log home, faulty flashing or gridlocked gutters that prohibit water from shedding properly can cause excessive runoff onto the logs and result in avoidable water damage. Keep it clean, people.